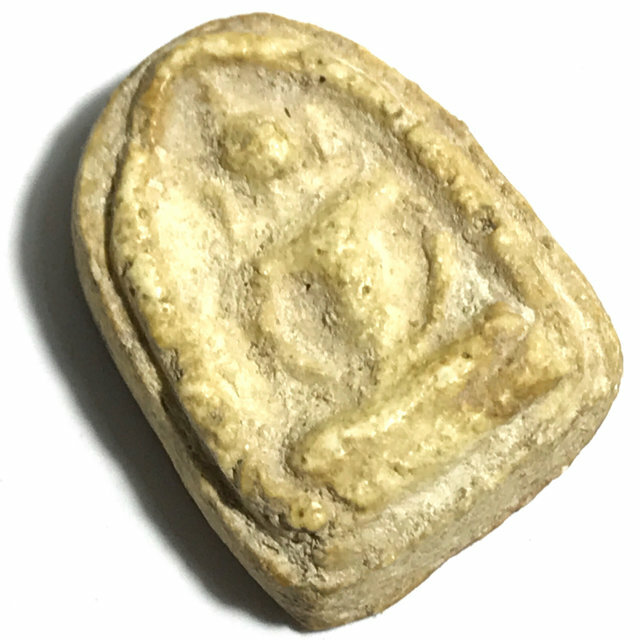 An all time Pra Niyom Classic, the Pra Pim Sum Gor Thaan Sung Kru Wat Ngern Klong Dteuy, Early Ratanakosin Era hiding place amulet (discovered in 2480 BE), from one of the most famous series in the world of Thai Buddhist Amulets; the Kru Wat Ngern Klong Dteuy. 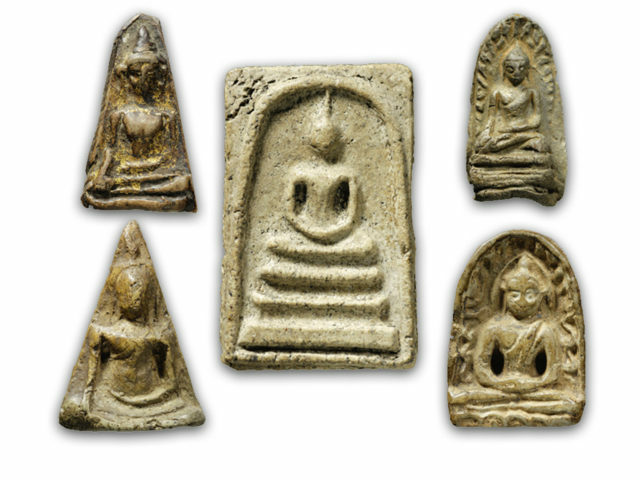 The Pra Kru Wat Ngern Klong Dteuy amulets are composed of Muan Sarn Clay that is almost identical in appearance to the clay found in the Pra Somdej Wat Bang Khun Prohm, and is as favourite study material for students of the amulets of Somdej Dto. Wat Ngern Klong Dteuy amulets are all found to be Buddha Images in different forms or postures, and are highly reputed for their Choke Lap Kaa Khaay power to attract lucky fortunes, and to bring successful Business. This model is a Pim Sum Gor Thaan Dtia, and has exquisite features, with 'Nuea Graeng' marble-like hardened Muan Sarn clay, and a character that simply exudes the level of refinement that only an amulet of true sacredness, age and pedigree can emit. The temple of Wat Ngern Klong Dteuy is a temple that cannot be seen anymore, for it is in the present day the location of the National Ports Ministry in Bangkok (Ta Ruea Klong Dteuy). Before the Ministry was built there, the Municipality was the location of Wat Ngern Klong Dteuy, Wat Hnaa Pratat and Wat Tong Lang. Wat Ngern Klong Dteuy was built in the Ratanakosin Era by a Millionaire family, Mr. and Mrs. Machorn, who were without children or inheritors, and so they spent their wealth on the building of a temple. The temple was at first named 'Wat Hiranya Sivali'. In the year 2480 BE, the Government needed the land back from Wat Ngern Klong Dteuy, Wat Tong Lang and Wat Hnaa Pratat, and served notice on them, and the temples were deconstructed. The Kru Wat Ngern Klong Dteuy amulet series was found in a very large number of different Pim Song (design models); Pim Sangkajjai Mai Mee Hoo, Pim Sangkajjai Mee Hoo (with ears), Pim Hnaa Ruesi, Pim Pra Kong, Pim Samati Hwaek Man, Pim Pha Lelai, Pim Prode Sadtw, Pim Sangkati, Pim Sum Gor Thaan Dtia, Pim Sum Gor Thaan Sung, Pim Leb Mer Samati, Pim Leb Mer Mara Wichai, Pim Pra Pid Ta, Pim Pra Pratan, Pim Pang Nakprok, Pim Mara Wichai Ha Liam, Pim Sum Gor Thaan Koo, Pim Khao Iang, Pim Yern, Pim Um Badtr, Pim Pang Perd Loke, Pim Pid Ta Rasamee, and the Pim Pang Sayasana. As the amulets were found, they were at first distributed at incredibly cheap prices as they were passed around, as the construction workers would keep finding them and put them into bags, and sell them on the marketplaces and to devotees around the temple. Then the Indo-China war began, and the 2nd World War came, and some devotees who wore these amulets were involved in miraculous lifesaving incidents which attributed Kong Grapan Chadtri Klaew Klaad power to the amulets, and devotees began to seek the amulets out fervently as a protection against the deadly dangers of wartime. The prices and rarity of the amulets increased rapidly during the wartime years, and the series became a High End collector's classic, with certain models fetching extremely high prices, for example the Pim Pra Sangkajjai Mee Hoo, being the most highly preferred of all models, and the Pra Sum Gor, also a highly esteemed model. From examination of the artisanry and the Muan Sarn Sacred Powders, one can conclude that the amulets were created sometime during the Early Ratanakosin Era. It is assumed that the amulets were made by some high ranking official or courtiers, or at least from a wealthy important family lineage. This is conclusive, because the artisanry and quality of Muan Sarn Sacred Powders are of the finest, and could only have been commissioned by an important influential wealthy sponsor. From the amulets found within the Kru chamber, there seems to be two distinct batches, revealing that the Pra Kru Wat Ngern Klong Dteuy amulets belong to two different batches, made at different times. 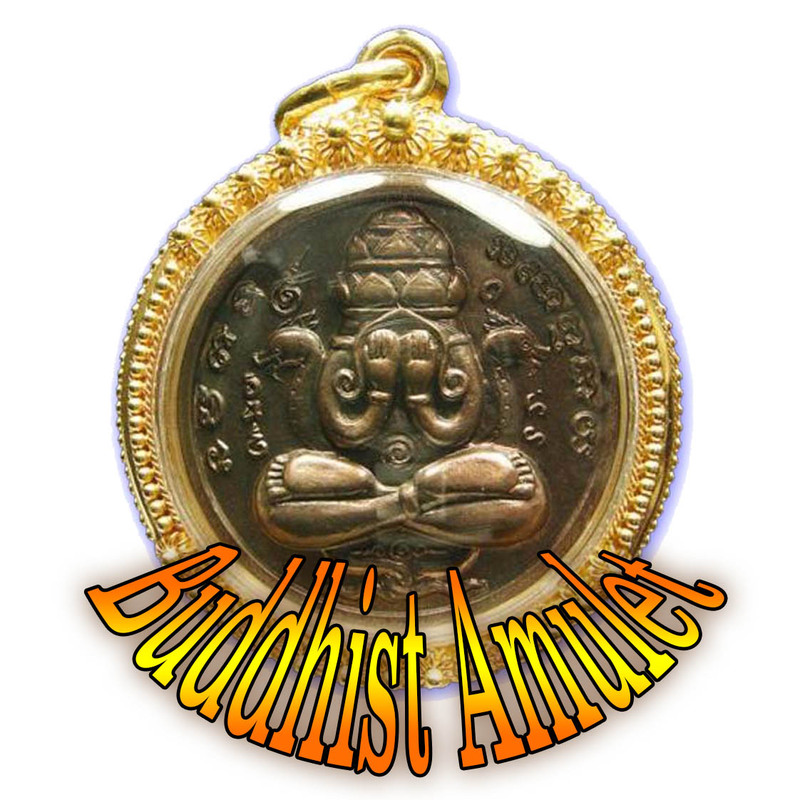 It is assumed the first time amulets were made and hidden in the Chedi was during the first few years of existence of the temple, sometime around 2335 BE. The amulets from the first batch are mostly larger amulets, and have very marble-like hardened stony texture, with shiny marbled surface effect. Most if these will have pong gesorn pollen powders risen up to float on the surface of the clay.